My goals for 2018 aren't strictly financial. I've been letting my health go for far too long. In 2016, when I went to see my OBGYN in Missouri for my annual wellness exam, she informed me that my Hemoglobin A1C was 5.7, which placed me in the prediabetic range. She was very concerned. If I didn't lose weight and focus on what I eat, I would develop Type II Diabetes in approximately five to seven years. I somehow forgot this conversation ever happened. Or at least I acted like it. 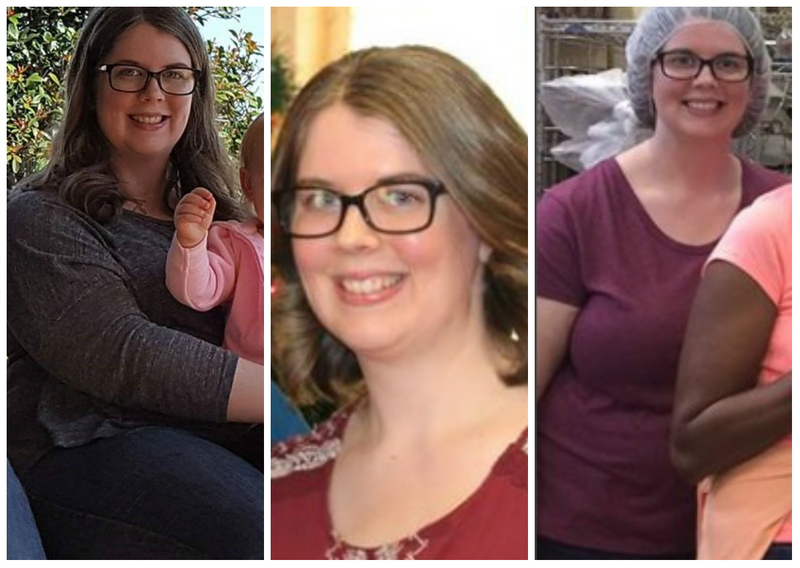 Because in 2017, I stopped running, I stopped doing yoga, and I ate whatever the heck I wanted. This is especially pathetic given where I've been. 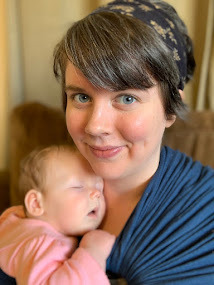 Let me remind you, especially if you're new here, how this blog started. If you click through my posts and go all the way back to the beginning, in 2012, you'll read about a 240-pound 23-year-old me who decided to stop being lazy and start pursuing her goals. The most important of these goals: weight loss. I changed the types of foods I ate. I started exercising. I became a vegetarian. I grew to love yoga. I started running 5ks, then 10ks. 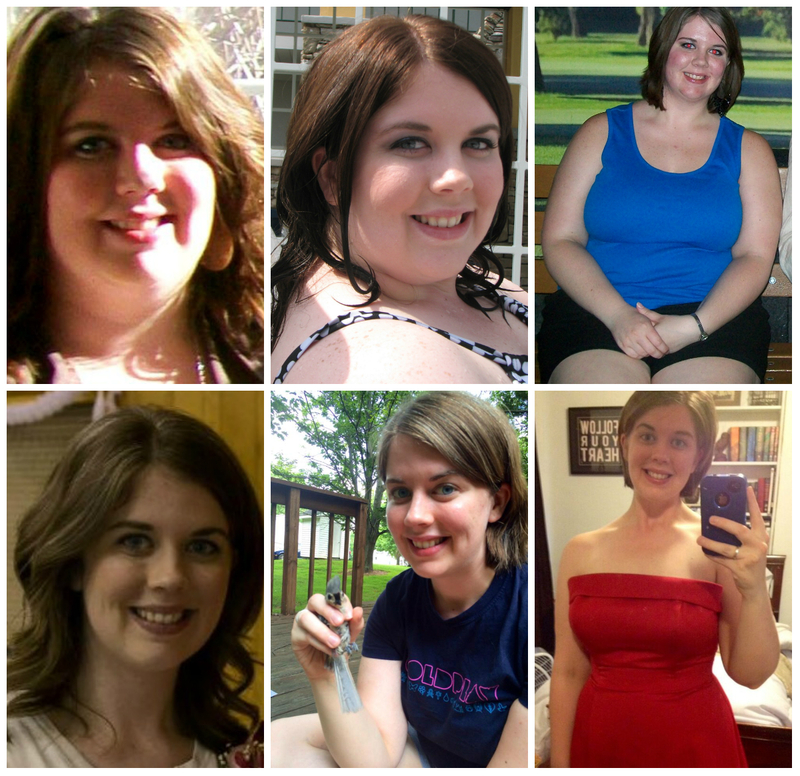 Over time, I reached 167 pounds, a loss of 73 pounds. Then, in 2017, despite recently learning I was prediabetic, something happened. Foods that had been off-limits for years now, foods I never even considered touching, were suddenly finding their way into my mouth. Dairy Queen Blizzards. Domino's pizza and bacon jalapeno stuffed cheesy bread. Pints of Ben and Jerry's (consumed in one sitting). 2-liter Dr. Peppers. McDonald's cheeseburger combos, large-sized. Is it any wonder this happened? Yeah, those are from 2017. I'm not sure what happened, honestly. 2017 was a rocky year financially, so maybe stress played a factor. From January to July, I also waited tables at Mellow Mushroom, my favorite pizza restaurant, where I gave in to free slices of pizza and unlimited free soda (which I hadn't drank in about three years prior to this). So maybe that's where it began. I'm not sure. Maybe those are excuses. I think I just stopped caring and did what felt good. It was more fun to eat rich, greasy junk than salads. It was easier to sit on the couch and watch Netflix than it was to get up and exercise. But by the end of 2017, I began noticing that nothing in my closet fit anymore. I started hating pictures of myself. I began feeling sluggish and bloated and gross all the time. I remembered my conversation with my OBGYN in Missouri. I was prediabetic. What in the world was I doing to myself?! 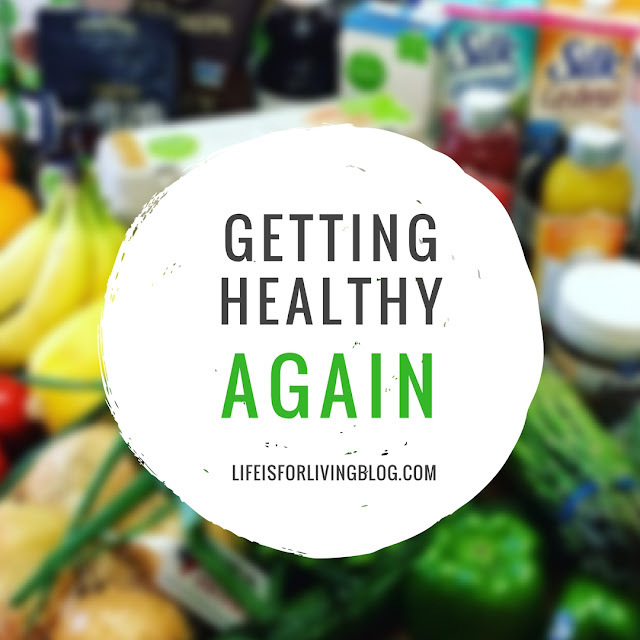 With the new year approaching, I resolved to refocus on my health. I weighed in on January 1, 2018, the first time I'd weighed in months. I swore I'd never see the 200's again. But look at that. 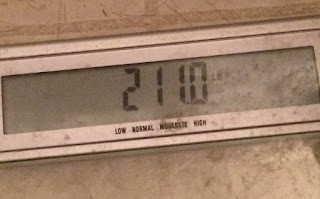 Thankfully, I'm not back up to my all-time heaviest (240), but if I don't intervene now, that's where I'm headed. 1. I visited a primary care doctor to assess the damage I've done. After gorging myself for a year on Triple Chocolate Blizzards and Ben and Jerry's Brownie Batter Core, I realized I may have pushed myself a step or two closer to diabetes. My HgbA1C was 5.7 in 2016 when I was still pretty healthy. I grew seriously afraid of where that number could be now. I found a primary care doctor in Huntsville and made an appointment for a much-needed physical. 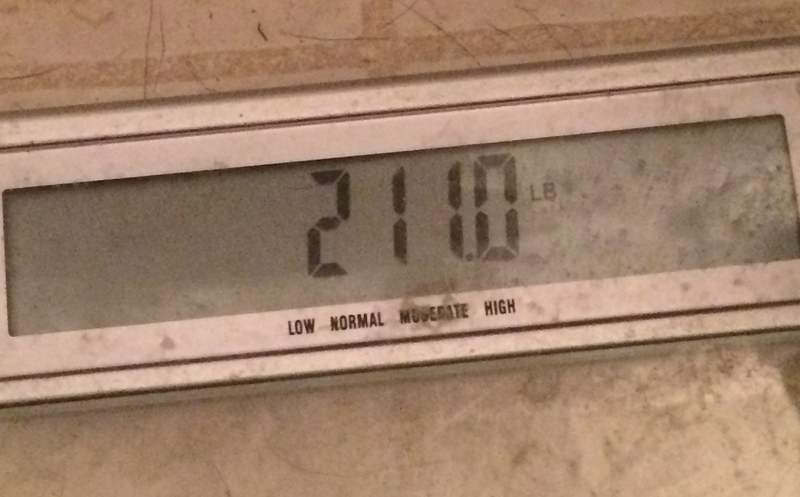 On January 2, I went in fasting for this exam and weighed 215 on their scales. They drew several vials of blood for multiple lab tests (including HgbA1C), and I'm scheduled to go back on January 15 to discuss the results. 2. I'm trying to follow a more plant-based diet. I can't forget how amazing I felt when I was a vegetarian. I felt so much lighter, and I had tons of energy back then. But after two years of being meat-free, I developed intense meat cravings. It started with BBQ pork. I gave in and ate some BBQ in 2015, and after that, there was no looking back. I guess I've been making up for lost time. I crave steaks, burgers, and fried chicken nearly constantly. There were weeks in 2017 when I had a cheeseburger almost every single stinking day. I need to find a balance. I can't say that I'll give up meat entirely, but I want to severely limit it. The goal is, basically, to eat more vegetables than meat, and to make sure the meat I do consume is high quality. No more McDonald's "beef" patties or Popeye's chicken. Instead, I'm trying new plant-based recipes, like the tofu scramble pictured above. Never before I had substituted silken tofu for eggs, but it's a pretty excellent trade-out. Also, of course, no more sugary, processed junk. I'm tee-totaling that one. No Blizzards, no donuts, no cake. I went years without any of that stuff, so long that when I did have a taste, it was too much. Too fake, too sugary. I've got my fingers crossed that I get to that point again. 3. I'm planning meals and snacks carefully. This really pertains to health and finances. I got this nice little meal planner for Christmas, and I'm loving it. There is space to fill in your menu for the week, conveniently alongside a grocery list. I tried it out for the first time last week, and it worked great. 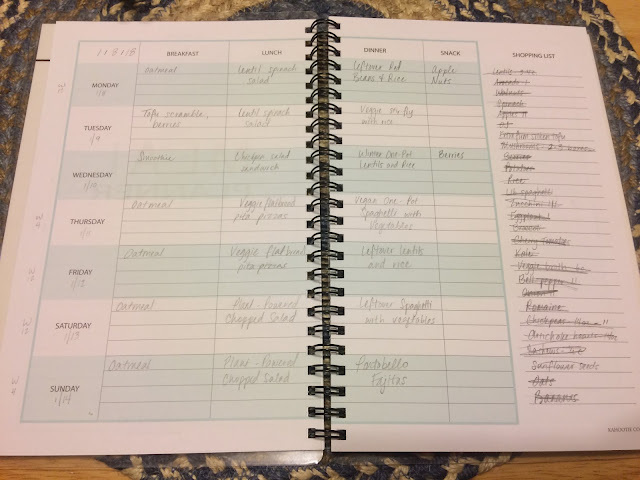 I took my planner to the grocery store and marked off things as I went, referring to the menu if I needed to remember what ingredients were for. 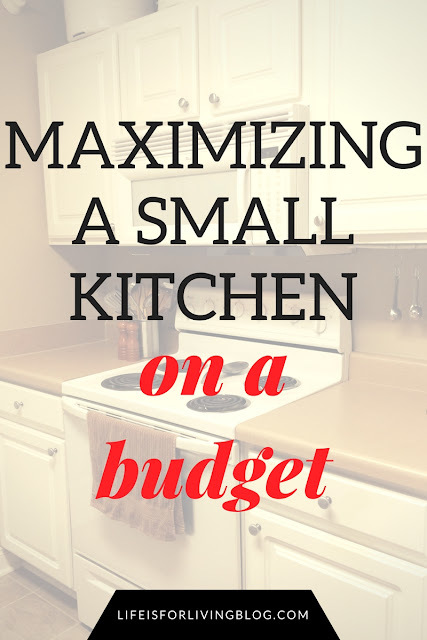 Sticking to a list for a pre-planned menu has always helped us stay on track with our grocery budget, and well, really with finances all together. If you have meals planned at home, you're less likely to stop by a drive-thru on the way home from work, which of course helps your wallet. I've been trying to plan for leftovers for work days. After a twelve-hour nursing shift, the last thing I want to do is go home and cook something. But if all I have to do is reheat something...that's no big deal. 4. I'm forcing myself to run again. And do yoga and lift weights and walk and stuff. I'd made such progress with running. I'd gone from running three feet and having an asthma attack to running 4.6 miles nonstop, without walking breaks. Then I opted for the couch for a year and went back to square one. Almost. I went out for my first run in a year yesterday, January 9, and made it a full mile without stopping to walk/stretch/cry. It was slow; 13:24. But that's my new baseline. My new PR to beat. I'm also getting back into yoga. I looooove yoga, and I had forgotten how amazing it makes you feel. Especially after pushing around a heavy med cart for twelve hours. This is the hardest for me, but I'm also trying to make sure I do some upper body strength-training with hand weights at least once a week. That sounds so pitiful, but I gotta start somewhere. My upper body has always been especially weak and flabby, so I've gotta spend some time focusing there. That's where I am today, and this is my plan for the year. I know this blog has become primarily finance-related, but I will be doing some health and fitness updates to keep myself accountable. And you know, the two really must go hand in hand. Because really, what is the point of working so hard to become debt-free if, at the end, you're too sick, medicated, and unhealthy to enjoy that freedom? I'm excited for your health and fitness posts... It actually makes me feel more accountable to. Because if I see you meet your goals, I feel like I can meet mine. Proud of you for not giving up and excited to see the results that are sure to follow your lifestyle changes! Thank you for your honesty in this post! You can do it!